Such were the lines from ‘Punch‘ to have two politicians who were commenting on the end of the great Whitebait Feast. 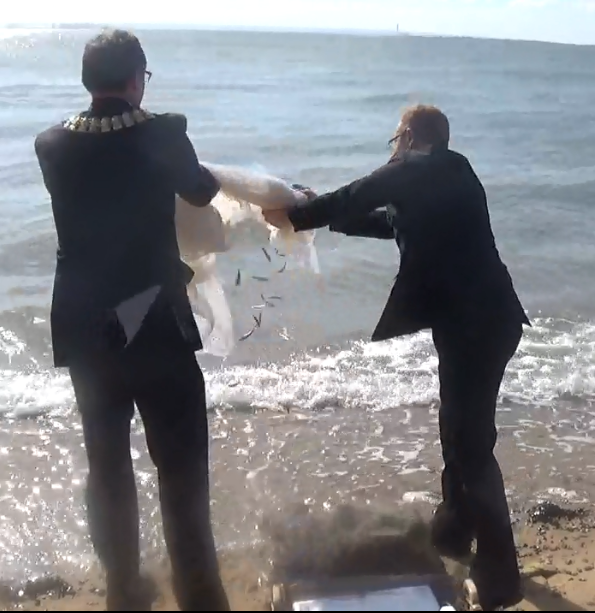 The consumption of baby sprats and herring – commonly called Whitebait – was such a popular dish in Essex that it attracted much ceremony which included members of parliament and even the prime minister! The association with an annual feast apparently is associated with those who funded the Barking Breach, a costly anti-flood venture which was built in 1707. This begun with the host Sir Robert Preson, the Dover MP inviting distinguished guests to his fishing cottage nearby. Then in 1766, the first Whitebait Feast first took place in Dagenham, this was largely a private affair, often attended by politicians and marked the end of the parliamentary season on or around Whit Sunday. The politicians would process by boat to the party. A regular attendee was the then Prime Minster, Pitt the Younger. He was concerned that the venue was too far too London and as such it moved to Greenwich. However this being a political activity there were two locales: the Trafalgar Tavern (for the Liberal members) and the Old Ship Tavern (for the Tories). The last such Dinner was held in 1894 a closure forced by the lack of Whitebait, a consequence of the Thames pollution rather than any political falling out. 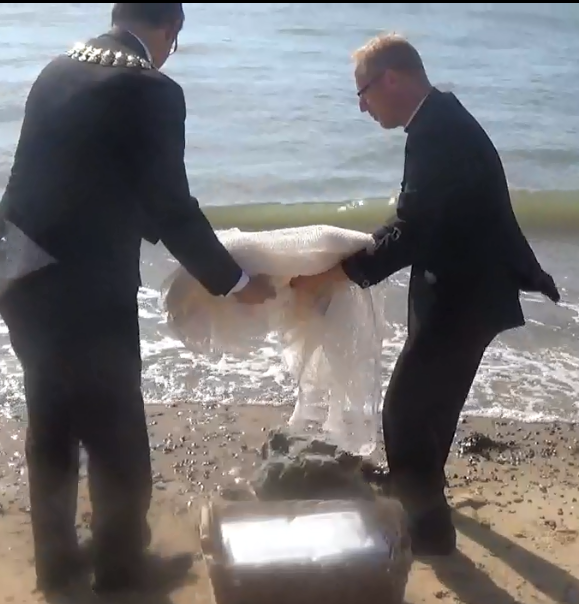 The custom consisted of an official opening ceremony with the catch blessed at from the end of the pier with the bringing in of the first catch. This catch was then taken to the feast. However a few changes have been made – since the burning down of the pier – the event has moved to the Bawley below Cliff’s Pavillion. The Mayor of Southend, other important people of the town and the ministers of the five different denominations attend. Arriving a few moments earlier one has to peer into the nearby restaurant where the whitebait feast occurs – tickets available from the Round Table – but don’t expect any prime ministers. 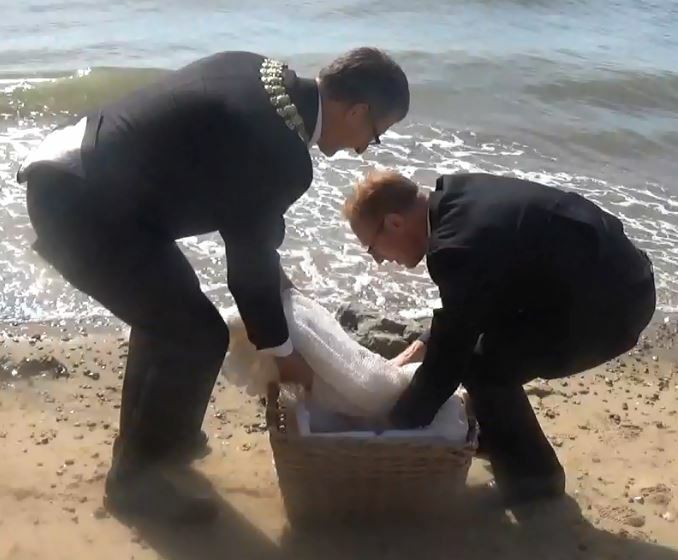 Here the party assembled and then vicar and mayor carrying a basket of whitebait in a white cloth. Gingerly making their way to the water’s edge, the vicar said a few words and together holding the fish and nearly dropping them they threw them back! Then the group went to a local restaurant to enjoy the Whitebait – although this is only the first course I would imagine! Sadly despite the blessing – much of the whitebait is caught 100s of miles away in the Baltic..and I am not sure the blessing gets that far!